Sailors from the United States and Brunei practice firefighting techniques during CARAT Brunei 2014. CARAT Brunei kicked off on November 2. On November 2, the United States and Brunei began an annual military exercise with an opening ceremony at Muara Naval Base in the Southeast Asian state. The 21st iteration of the Cooperation Afloat Readiness and Training (CARAT) Brunei exercise is designed to address shared maritime security priorities, develop relationships, and enhance cooperation between the two navies. 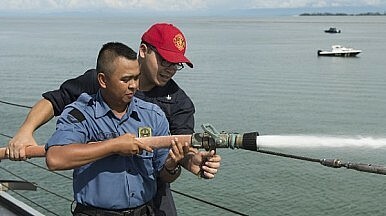 It is part of a series of bilateral naval exercises conducted by the U.S. Navy with partners now involving nine countries in South and Southeast Asia – Bangladesh, Brunei, Cambodia, Indonesia, Malaysia, the Philippines, Singapore, Thailand, and Timor-Leste (See: “US Eyes Expanded Military Exercises with ASEAN Navies”). Brunei was one of the original CARAT partners and has been part of the exercise series since it began back in 1995. According to a statement by the U.S. Navy seen by The Diplomat, CARAT Brunei 2015 will continue through November 11 and will involve over 500 U.S. military members alongside counterparts from the Royal Brunei Armed Forces along with key U.S. assets. It will feature ten days of shore-based and at-sea training events as well as professional symposia to share best practices in various areas including maritime security and military medicine. There will also be hands-on training at sea in combined operations, naval gunnery, search and rescue, and maritime interdiction. CARAT Brunei 2015 will feature two notable firsts, Arlo Abrahamson, public affairs officer at the U.S. Seventh Fleet’s Task Force 73 (which helps plan and execute these exercises), told The Diplomat. The first is the presence of the U.S. Navy P-8 Poseidon aircraft conducting maritime domain awareness training with the Royal Brunei Armed Forces. The second is the participation of the USNS Millinocket (Expeditionary Fast Transport Ship) used for replenishment at sea approaches and tactical maneuvers with other participating ships. In another highlight for this year’s exercise, the Royal Brunei Armed Forces’ Sikorsky S-70i Black Hawk helicopter will make deck landings aboard the Arleigh Burke-class destroyer USS Lassen (DDG 82) – the vessel involved in the recent U.S. freedom of navigation operation near China’s artificial islands in the South China Sea – while a U.S. Navy MH-60R helicopter will make landings on the flight deck of the Royal Brunei Ship Darulehsan. Addressing the issue of freedom of navigation in the South China Sea in a conversation with media at the opening of CARAT Brunei 2015, Rear Admiral Charles Williams, the commander of Task Force 73, stressed that U.S. naval vessels including the USS Lassen would continue to operate in international waters as they have for decades, since a persistent presence is key to tackling common challenges. “The United States as a maritime nation and a Pacific nation has been present in the region for decades…This is our third decade doing CARAT with Brunei. So it’s that persistent presence that helps us address those threats,” Williams said, according to The Brunei Times. In an interview with The Diplomat published last month, Williams had stressed the importance of persistent presence and revealed that U.S. exercises in the Asia-Pacific would expand in 2016 (See: “US to Expand Military Exercises in the Asia-Pacific in 2016” and “Interview: The Future of US Military Exercises in the Asia-Pacific”).